Haere-roa, the new and keenly anticipated University of Canterbury Students’ Association building, opens this July. The old UCSA building, sited alongside the Avon River, had to be torn down as a result of the earthquakes and its absence left a big hole in the city’s cultural landscape. The new building has spaces for hospitality and events, student support and clubs, and meeting rooms. Like its famous predecessor, Haere-roa will be enjoyed by UC students and be available to the wider community. A key space is the new Ngaio Marsh Theatre and Performance Space, a flexible facility able to host a crowd of 1000 standing or up to 320 seated. As well as student performances and gigs, it will be used by UCSA’s 150 affiliated clubs and societies. 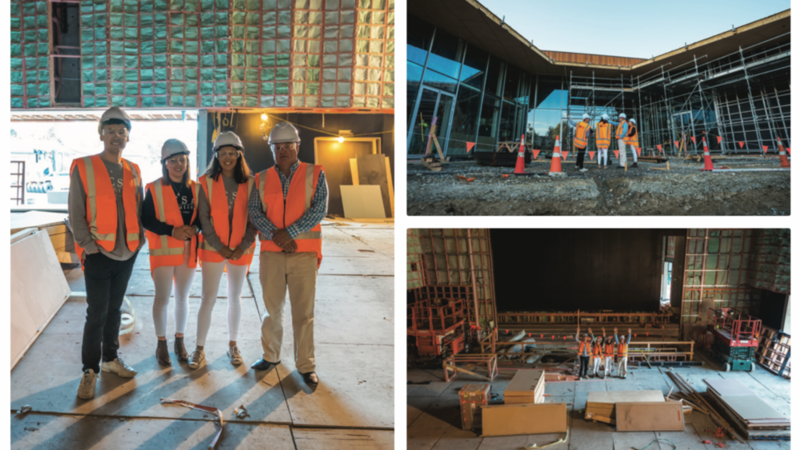 The theatre created memorable experiences for generations of UC students, and the Association is looking forward to the new facility becoming just as important in the memories of UC students and Christchurch people. The UCSA has been fundraising for the past couple of years to make up a $5 million shortfall to complete Haere-roa. More than 440 donors have contributed $2.8 million to this effort, including leading Canterbury companies. The association is now offering the community the opportunity to “save” a seat in the new 320-seat Ngaio Marsh Theatre, by purchasing a seat for $500. Haere-roa will also be made available to organisations and companies, with some bookings already in the diary. Local electronics developer and manufacturer, Tait Communications, will be the first major corporate to use the facility when they celebrate 50 years in business in July. With the Ngaio Marsh Theatre and Performance Space and its retractable seating, coupled with a variety of other spaces, the building will be ideal for conferences, meetings, functions, and much more. These spaces are fitted out with state-of-the-art equipment, hospitality and catering facilities. Haere-roa will open in July and booking enquiries can be made to functions@ucsa.org.nz. To Save A Seat in the new Ngaio Marsh Theatre, and play a key role in the fundraising for the UCSA’s new home, visit ucsa.org.nz.